Make some great memories around a campfire toasting marshmallows for s’mores and telling ghost stories before you got to sleep. 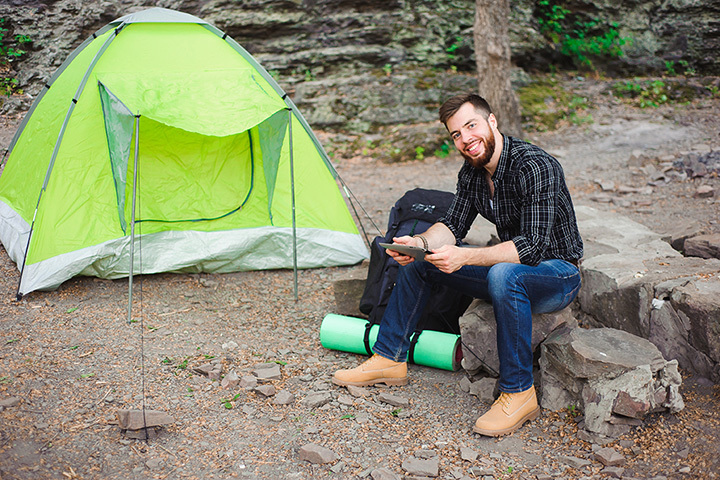 If you love to camp in the great outdoors, Oklahoma has some excellent sites that offer spaces for tents, RVs, and in some cases, even have cabins to rent. Grab your sleeping bag, a flashlight and a match to light the fire and come out to one of these great campgrounds. Bring your horse with you to this getaway in the Ouachita National Forest. You’ll find 32 RV sites and luxury cabins at this resort where you can also find accommodations for your equine. Please note, the ranch does not offer horse rentals. The Illinois River might be known for float trips, but there are many great places to camp in the area. Eagle Bluff has a late-night campsite for night owls, but has another section for families who want to be in bed by 11 p.m. It’s even got a children’s playground, along with other amenities that every camper wants nearby. Parks, beaches, cabins, an RV park and an ATV/motorcycle area are available in the park areas at the state park. There’s also a golf course and nature center nearby. Lake Murray has a fishing pier on the lake and you’ll find many different areas to pitch a tent. One of the few places where you can actually rent a tepee for an overnight camping experience. You won’t be able to swim in the lake, but fishing and boating are acceptable. There are three natural springs close by if you just have to get wet. During the summer, this is one of the best campgrounds because as you go down into the Canyon, it actually gets about 10 degrees cooler. In this state park, you can rappel down the sides of the canyon walls right into your campsite. The park offers showers, RV sites and a fishing pond. Lakes, hiking trails, cliffs and caves are all part of this state park that once was a hideout for Jesse James and Belle Starr. Enjoy trout fishing, hiking and hunting or just come down to check out the fall foliage and great views. With over 1,600 acres of sand dunes, Little Sahara is one of the best places to take out your dune buggy or ATV. It’s also a fun place to camp with all the amenities you need close by one of the 143 tent sites. As Oklahoma’s oldest natural park, you’ll find a special family park with a variety of activities. Enjoy mineral waters for fishing and boating. Swimming is allowed. The forest and prairie have great views for photographers. A unique state park that has salt leftover from when an ocean covered Oklahoma during prehistoric eras. The lake is about half as salty as the ocean. Swimming is allowed in the lake, as is fishing. It’s a great place to canoe or kayak as well. Alabaster Cavern is the largest natural gypsum cave in the world that is open to the public. There are only 12 tent sites which are first-come first-serve, but this is the place to go if you enjoy caves and bats.